Spelling You See Level C: Wild Tales is suggested for a student who knows letter sounds and spells many common words correctly. Spelling You See Level C: Wild Tales will continue your student's journey through the Skill Development stage (see the "Spelling You See Philosophy" link above for an explanation of each stage). Following stages, not grade level, this level is suggested for a developing reader who prints easily with lowercase letters and who knows most letter sounds, including long and short vowels. Is my student becoming comfortable with reading? Can my student comfortably write two or three sentences at a time? The following passage is written at the minimum reading level for Wild Tales. Can your student read it without difficulty? Some Sheep are wild. Bighorn Sheep live on mountains and high hills. Male sheep are called rams. They use their horns to fight other rams. Flocks of sheep eat grass in the meadows. They climb steep hills to find more food. Was my student able to complete the dictation with relative ease? Was my student able to complete the dictation in 10 minutes or less? Did my student correctly spell at least eight of these words from the dictation passage: sheep, called, horns, they, fight, eat, grass, hills, find, food? If you answered "Yes" to all these questions, your child is ready to begin Wild Tales. Wild Tales will provide opportunities for students to study words in the context of real-life stories about animals. Students will mark various letter patterns, copy passages, and produce their own stories or drawings. They will also practice writing the stories from dictation with assistance. Thirty-six lessons focus on searching for marking letter patterns ("chunking"), introducing consonant chunks, and teaching a variety of writing skills including copywork, dictation, and free writing. Lessons are divided into five parts (A through E); each part includes two to four daily worksheets. These lessons are split between two student workbooks for ease of use. For the first seven lessons, the nursery rhyme theme from the previous book Jack and Jill is continued. For lessons 8-36, students transition into non-fiction passages about animals. The instructor's handbook features the philosophy and overview for the program, frequently asked questions, short instructions that cover individual and multiple lessons, and a weekly activity guide. This is followed by passages for dictation. A line-listed answer key is also provided. SpellingYouSee C: Wild Tales Student Workbook Part I: 207 pages, softcover. Instructor's Handbook 52 pages with glossary, softcover. 9.25" x 8". The "SpellingYouSee" program from Demme Learning is a unique, research-based homeschool spelling curriculum with seven levels that follow the developmental stages of language development. Developed by Dr. Karen Holinga, this program allows students to develop spelling skills naturally and at their own pace with the direction and encouragement of the instructor. Relying upon visual memory that's built through repeated reading and repeated writing, students will learn spelling through short daily activities that integrate copywork, reading, speaking, and listening, rather than relying on rote memorization for weekly tests. Spelling You See Level C: Wild Tales is suggested for a student who knows letter sounds and spells many common words correctly. See the "Spelling You See Philosophy" link above for an explanation of each stage. Some sheep are wild. Bighorn sheet live on mountains and high hills. Male sheep are called rams. They use their horns to fight other rams. Flocks of sheep eat grass in the meadows. They climb steep hills to find more food. Did my student correctly spell at least eight of these words from the dictation passage? - sheep, called, horns, they, fight, eat, grass, hills, find, food. This course relies upon teacher instruction and the (sold-separately) Wild Tales Student Workbook Set cannot be completed without this instructor's handbook. It features the philosophy and overview for the program, frequently asked questions, short instructions that cover individual and multiple lessons, and a weekly activity guide. This is followed by passages for dictation. A line-listed answer key is also provided. 52 pages with glossary, softcover. 9.25" x 8". This course relies upon teacher instruction and this student workbook cannot be completed without the (sold-separately) Wild Tales Instructor's Handbook. Thirty-six lessons focus on searching for marking letter patterns ("chunking"), introducing consonant chunks, and teaching a variety of writing skills including copywork, dictation, and free writing. Lessons are divided into five parts (A through E); each part includes two to four daily worksheets. These lessons are split between two student workbooks for ease of use. For the first seven lessons, the nursery rhyme theme from the previous book Jack and Jill is continued. For lessons 8-36, students transition into non-fiction passages about animals. 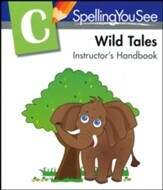 SpellingYouSee C: Wild Tales Student Workbook Part II: 219 pages, softcover. Both are consumable, non-reproducible workbooks.